Current poultry diets contain much higher levels of maize and byproducts of dried distillers grains with solubles (DDGS) than in the past. This makes it important to know the effect of feed containing medium to high concentration of Fusarium mycotoxins in poultry. Earlier experiments, which were conducted for shorter periods or used single purified compounds, showed that poultry was resistant to deoxynivalenol (DON). More recent experiments, utilizing naturally contaminated grains fed to poultry for extended periods, have now shown that combinations of Fusarium mycotoxins pose significant risks to poultry performance and health. Contamination of animal diets with DON can result in great economic losses for animal production. The 2017 Nutriad Mycotoxin Survey covered 51 wheat samples from across Great Britain and Ireland. More than 350 analyses were conducted to test for the presence of the 7 mycotoxins: aflatoxin B1 (AfB1), zearalenone (ZEN), DON, T-2 toxin, HT-2 toxin, fumonisins (FB1 + FB2) and ochratoxin A (OTA). 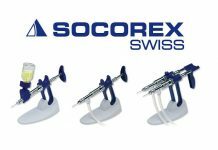 All 7 mycotoxins were analysed by liquid chromatography tandem mass spectrometry (LC MS/MS). The results showed that 74,5% of wheat samples were contaminated with DON and none of the samples contained AfB1T-2 toxin, HT2-toxin nor FUM. The average concentrations of all identified mycotoxins were medium while the highest concentration of DON found in one of the samples reached 1180 μg/kg. 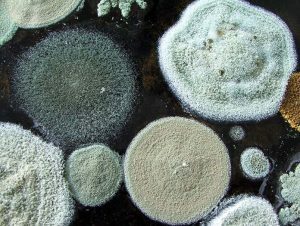 Although 35% of the samples were contaminated with ZEN, a mycotoxin affecting reproductive functions of all animal species, its average concentration was negligible at only 38 μg/kg. However, the maximum concentration of ZEN found in one of the samples was 164 μg/kg and this level may be significant for sows, boars and piglets. As expected, none of the samples were contaminated with OTA. Comparing DON and ZEN contamination levels of wheat in the years 2014, 2015, 2016 and 2017, it is clear that the contamination levels in 2017 are significantly higher than in the 3 previous years. The Nutriad 2017 mycotoxin survey concluded the quality of wheat is slightly worse than the previous year and significantly worse than in the years 2014 and 2015. DON was the predominant mycotoxin found in this survey. The impact of DON on growth performance of poultry is highly variable (reduced feed intake, weight gain and feed efficiency) and dependent on the species of poultry and on the diets used. Chickens are considered to be less sensitive to DON when compared to other species. This can be attributed to the differences in DON absorption, distribution, metabolism and elimination, in addition to the hypothesis of a protective effect of the renal first pass effect, which exists in chickens. The first pass effect is mediated by different gastrointestinal and hepatic enzymes that result in the oxidation, reduction or hydrolysis (phase I reactions) and/or conjugation (phase II reactions) of toxins. This metabolism of orally administered mycotoxin results in a significant reduction of the amount of un-metabolized DON reaching the systemic circulation. Chickens resist DON due to the low level of absorption into plasma and tissues in addition to rapid clearance. A limited oral absorption and rapid plasma clearance of DON was found in turkeys. The intestinal microflora in birds can convert DON to de-epoxy DON (DOM-1), whereas the degradation of the epoxide group by reductive cleavage of the toxic 12, 13- epoxy ring is carried out by intestinal microflora in chickens. However, DON can induce reduced feed intake in the absence of clear clinical symptoms, which cannot be separated from the direct effect of DON contamination on immunity, hematology and health parameters. Turkeys appear to be more sensitive to Fusarium mycotoxicoses than chickens, whilst ducks have been shown to be the most resistant poultry species. Turkeys are more sensitive to Fusarium mycotoxins than other avian species. Earlier reports suggested that turkey poults could tolerate 5 mg/kg DON in naturally contaminated wheat-based diets without any significant changes in feed intake or body weight gain. However, increasing the proportions of artificially contaminated wheat in turkey diets up to 5.4 mg/kg DON and 0.4 mg/kg ZEN resulted in a dose dependent decrease in body weight gain. The body weight gain decreased as early as in the third week of feeding. Even lower levels of DON, combined with 15-acetyl-DON and ZEN, in naturally contaminated diets caused decreased body weight gain, increased plasma uric acid, and increased relative weight of the gizzard and bursa of Fabricius. Feeding highly contaminated grains to turkeys for 12 weeks reduced growth rates in all growth phases. Fusarium mycotoxins affect cell-mediated immunity more than humoral immunity. DON can also induce changes in brain neurochemistry which may lead to altered behaviour and emotional stress in turkeys. Comparable findings in brain neurochemistry have been described in layers fed naturally contaminated diets. Feeding naturally contaminated diets containing 3.3 mg/kg DON, and lesser amounts of 15-acetyl-DON and ZEN, reduced villus heights in the duodenum of turkey poults in the starter phase and in the jejunum in both the starter and grower phases. These birds had reduced growth rate. In conclusion, the main negative effects of Fusarium mycotoxins in turkeys are, decreased daily weight gain, a lower final weight and a reduced Feed Conversion Ratio (FCR). 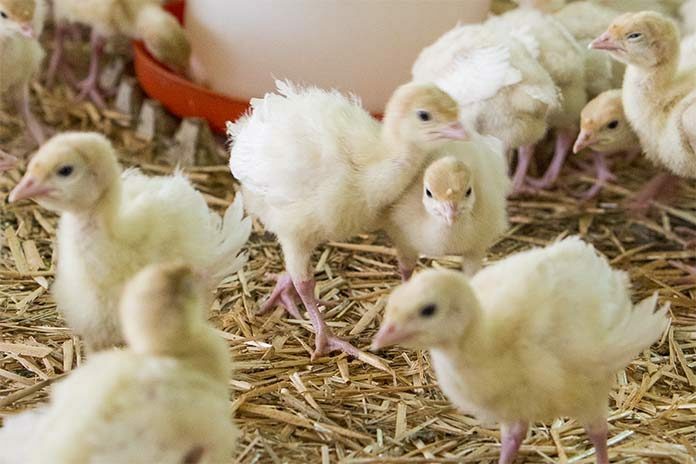 The purpose of this trial was to show the negative impact of contamination with deoxynivalenol (DON, vomitoxin) in turkey poults feed and the ability of three mycotoxin deactivators to minimize DON effects in vivo. 1596 one-day-old Hybrid tom turkeys were randomly placed into 38 floor pens (42 poults/pen). Each pen was assigned to 1 of 5 treatments in a randomized complete block design with each pen blocked by room and location within a room. Basal feed was prepared using uncontaminated or naturally contaminated maize. The treatments were then added to a standard turkey starter diet (Table 1). Turkey poults and feeders were weighed by pen at placement, and then once per week throughout the five-week experiment. The data was analyzed by analysis of variance (ANOVA) with contrasts used to compare the DON treatment to each of the 3 products. The turkeys fed the UNIKE®PLUS treatment consumed more feed compared to those that were fed the DON contaminated diet (Figure 1; P<0.05). However, the feed consumption of birds fed Products A or B was not different from the DON treatment (P>0.10). With higher average daily feed intake, birds assigned to the UNIKE®PLUS treatment had a higher average daily gain and a higher final body weight compared to the DON treatment (Figure 2; P<0.10). The rate of average daily gain and body weight of turkeys fed the other 2 additives (Products A or B) were not different from the DON diet. There were no statistically significant differences in feed efficiency between treatments (Figure 2). 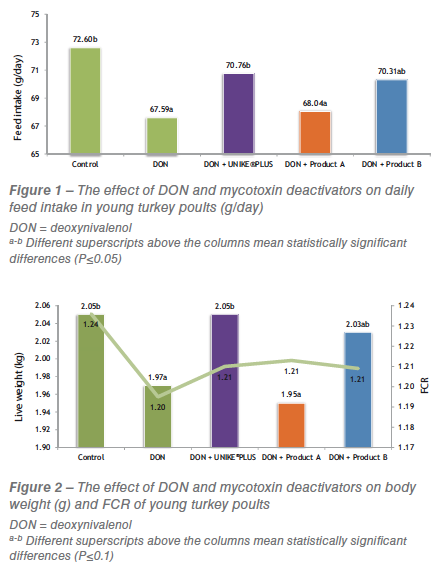 This experiment demonstrated the negative influence that DON (and possibly other trichotecenes) has on feed consumption and the subsequent impact this has on the FCR and growth in young turkey poults. 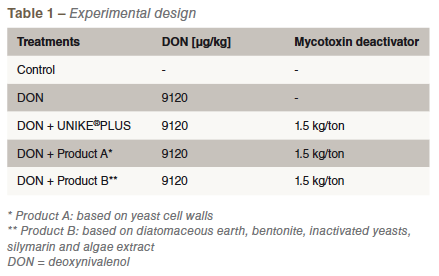 The mycotoxin deactivator UNIKE®PLUS reduced these negative effects and clearly performed better than the other two common brands of mycotoxin deactivators. This year, special attention should be paid to contamination of feeds by DON and ZEN and appropriate measures should be taken to mitigate against the effects of their presence in animal feeds. The last possible line of defense is the detoxification of mycotoxins in vivo. 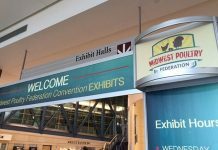 The addition of proven mycotoxin deactivators to animal feeds is a very common method to prevent mycotoxicosis and is an effective strategy to keep mycotoxin risk low under any and all conditions.